Tell me, how was I supposed to resist a lipstick with a shade called French Sourire, which means Smile? You already knew that I tend to pick the shades of makeup I buy based on their name - that's another proof if you needed one! Shine Lover is the newest addition to Lancôme's lipstick line, launched right in time for the spring/summer season, and promoted with beautiful pictures featuring Lupita Nyong'o. The brand describes it as a Vibrant Shine Lipstick with "pulsating colors" and a "balmy texture with moisture that hydrates, rejuvenates, and smooths lips", infused with "Rose de Muscat Oil". I did a little a research on "Rose de Muscat" because I had never heard of it. I think that they mean Rosa Moschata, which is the latin name botanists use to describe what is commonly called Rosehip (generally called Rose Musquée in French). I could be wrong, but I haven't found anything else that could be described as "Rose de Muscat". Anyways, new lippie means new tube design! 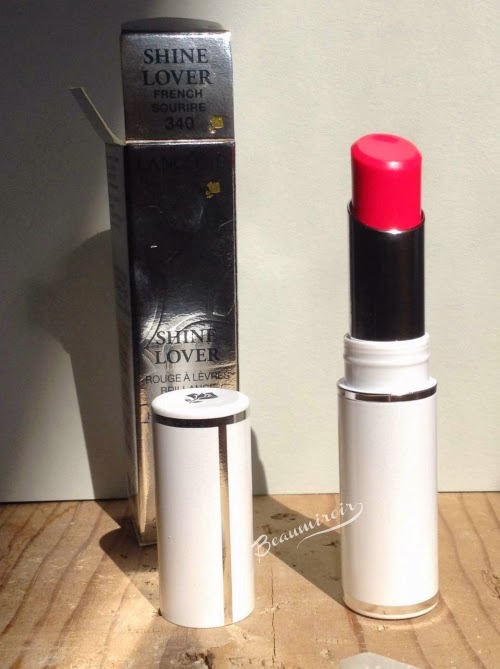 Shine Lover comes in a slim white plastic tube that I initially thought was metal, with a bit of subtle shimmer (the shimmer refused to show up on my pictures) and silver details, including Lancôme's famous rose. Have you noticed how shiny or sheer lipsticks are almost always packaged in slimmer tubes than creamy and opaque ones? This white tube is pretty, fairly unique (I can't think of another high-end lipstick in a white tube) and sturdy enough to carry around. The lipstick itself feels like a gel formula. It's completely weightless, it has a good slip but is easy to control, and it glides effortlessly on the lips, providing even color coverage. I was expecting something sheer, and it is translucent, but it also packs a ton of pigment. You can definitely see my lip freckles show through, however the color payoff is high enough that this shade is kind of a statement ! With a single swipe, I get a bright pop of color that brightens my whole face. 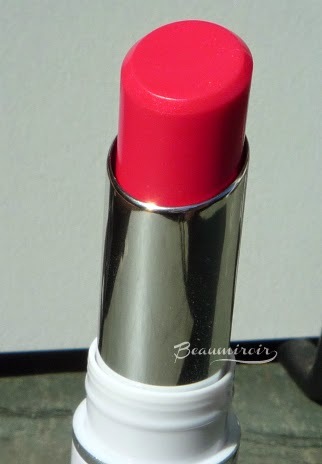 French Sourire #340 is a hot pink with a hint of coral that leans towards fuchsia on my lips. It's really a beautiful color that makes me look radiant and happy. 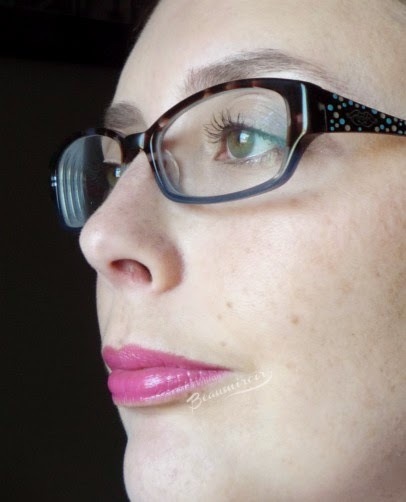 I'll let my husband describe how Shine Lover Lipstick in French Sourire looks: "your lips are really pink, but it doesn't look like you have paint on them". His words to say that it's a high impact shade with no visible texture! It has a good level of shine, but it's not a glossy formula. 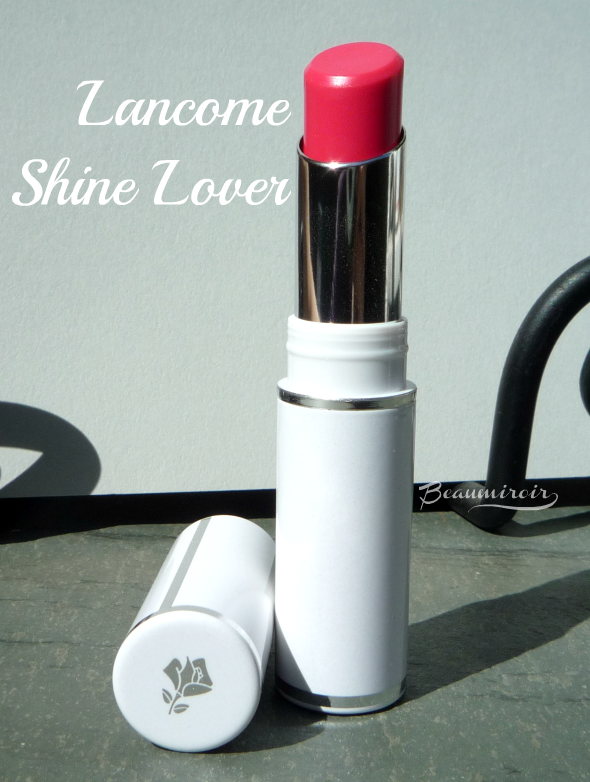 Don't be fooled by the Shine Lover name, what this lipstick loves most is color! The shades offered are all sheer but juicy and colorful, and none of them have shimmer. I took a quick picture of swatches I made in a store - unfortunately I can't tell you which shade is where, but it gives you an idea of the colors in the range. 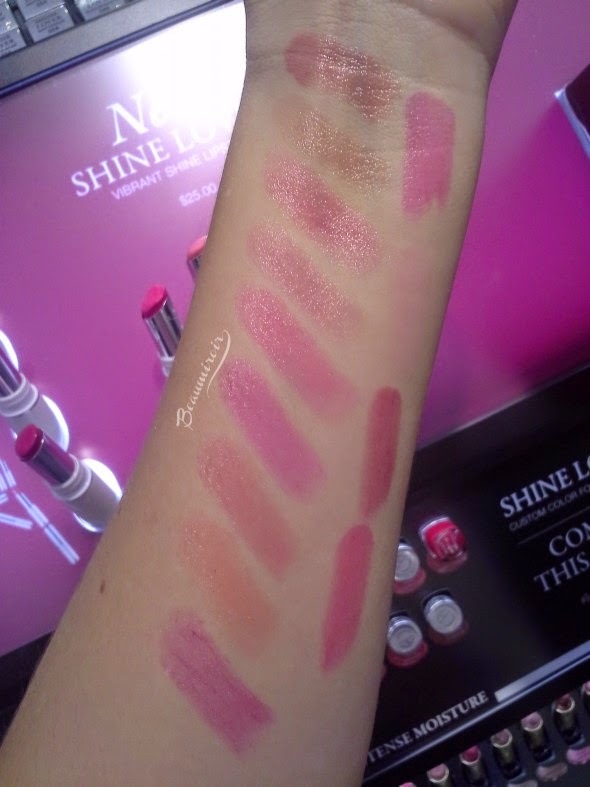 You can see that there are a lot of pink variations, and Corail Lover (the other shade I was into) was missing from the display. Second good surprise after the punchy color, Shine Lover LASTS FOREVER. I was really not expecting it at all, as shiny sheer lipsticks usually disappear fast, but French Sourire leaves a bright stain behind. The shine goes away after an hour or two, but the color stays bright and beautiful for 4+ hours. I tested it through 2 cups of tea, a banana and a glass of water, and the color was still very visible after 4.5 hours. The great thing is that it stains without drying out the lips at all. It's very comfortable on just after application, but even as it wears away, my dry lips stay nicely moisturized and supple. 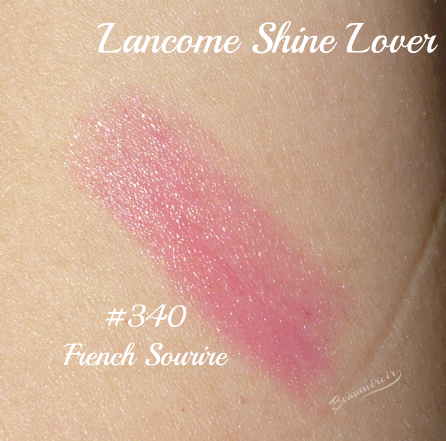 Overall: Lancôme Shine Lover is a fantastic lipstick and the best makeup launch so far this year. It manages to be vibrant and brightening but remains sheer and easy-to-wear, it wears incredibly long for a lipstick of this sort, and it does all that while keeping lips moisturized and comfortable. At $25, it's also about 20% cheaper than most high-end lipsticks. This is NOT your typical shiny lipstick and you need to try it for yourself! Impressive staying power and a very nice color. I amanita into pinks too much, but I love the coral hint. Yes it wears so much longer than I expected! Woooow OK I definitely need to try one of these! I was thinking they'd just be pretty sheer, and sheer lipstick do not tend to show up well on my lips. Seeing this on you has made me change my mind! I like the way your husband described the finish as well. It's spot on! Yes it's so much more pigmented than I expected too! The most vibrant ones, as far as I can tell from swatching, besides French Sourire are the red one and the darker pinks. But there are really only 2 that seemed a little too sheer for me, the lightest beige and pink. You know, I've discovered that dudes are pretty good at describing makeup in a down-to-earth way. A few months after we first met, my husband told me my eyes looked like fish skin. It was a compliment on my metallic eyeshadow, lol! I like it! The pigmentation on this particular shade looks amazing. I want to try one of these, I am really liking this sheer lip trend a lot! 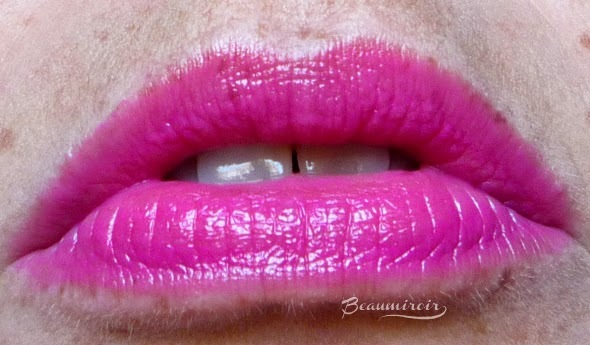 Yes I recommend this shade if you like hot pink or fuchsia! I think this is the first time I'm feeling curious about these. $30 is kind of a lot for something sheer but since you say it's not really... I gotta go swatching. Let's say that it's no small amount of money but cheaper than the equivalents by Chanel, YSL, etc. Yeah I think you should swatch when you have a chance, but for me the real revelation happened when I applied it on my lips. That's when the vibrant but translucent quality became apparent.